Hi everyone, I'm back! 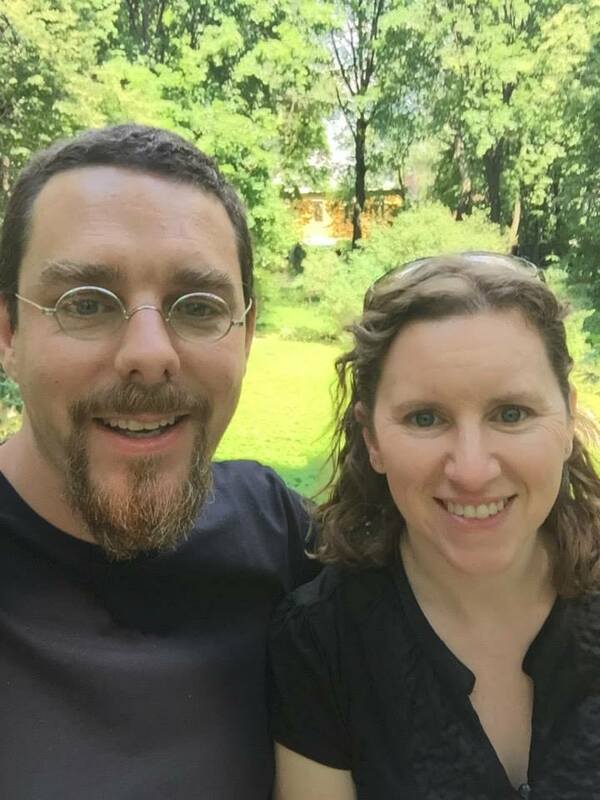 I just spent a week and a half on vacation in Russia. Would you like to see some pictures? If not, avert your eyes! The first half of our vacation was in St. Petersburg, where all the buildings are shaped like this. Did you know that there are canals in St. Petersburg? They're very nice, and break up the monotony of all the buildings being the same height and shape. Seriously, walking down the street feels like you're in a tunnel. At least the parts of the city where we went. Our first stop was the Museum of Soviet Arcade Games. Luckily, it's not a traditional museum, so we were able to actually play the games. Then we went to the Church of our Savior on the Spilled Blood, which was built on the spot where Alexander II was murdered in 1881. 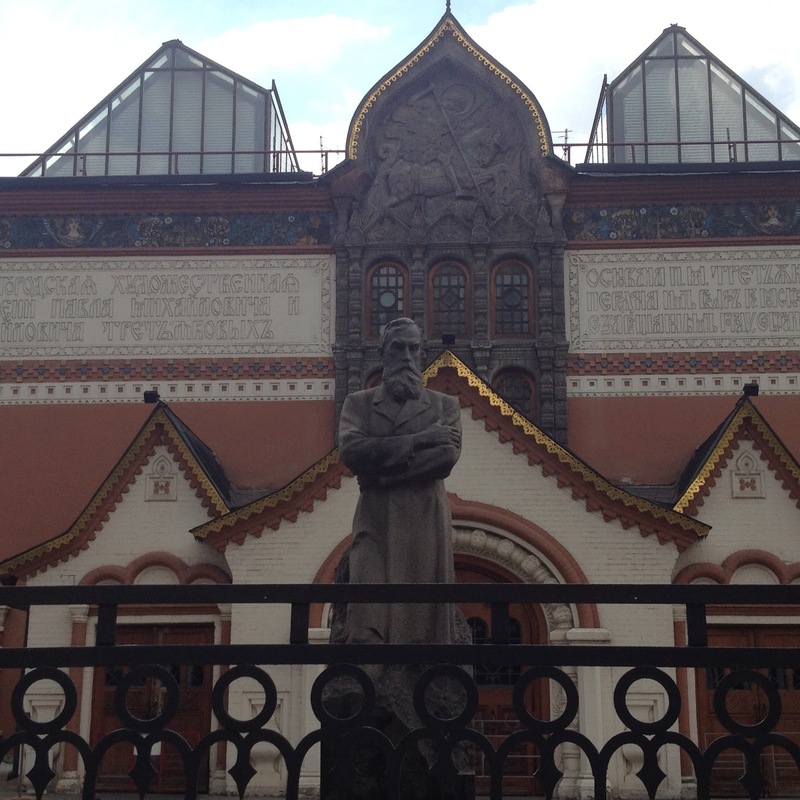 We looked at art at the Russian Museum and the Hermitage. The Hermitage is overwhelmingly huge, so the only building we visited was the opulent Winter Palace. Here is one of my favorite rooms. Most of our activities were in one area, within walking distance to where we were staying. 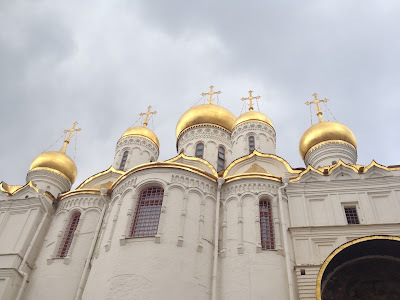 But one day we did take a train to the Peter and Paul Fortress. The last Romanovs, who were killed in 1918, were buried there after their bodies were found in 1991. 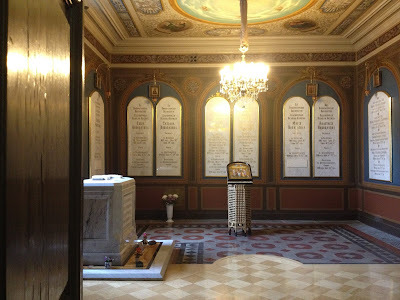 This room of the cathedral is dedicated to them. 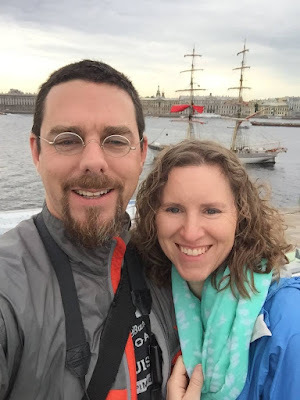 And here's a nice picture of Eric and I on the wall of the fortress with the Neva River behind us. We also attended a ballet at the Mariinsky Theater, even though neither of us really like ballet. It was nice though. And of course we ate a lot. 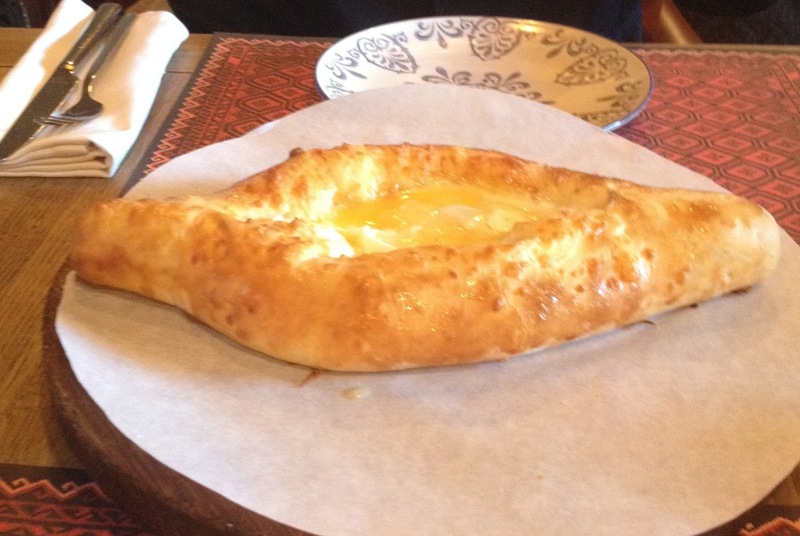 I have discovered one of the most delicious foods in the world, which is called khachapuri. It is bread filled with cheese and there's a well in the center in which they put a raw egg and then you mix up the eggy cheesy goodness and break off bits of bread to dip in it. It is heavenly. Of course there were also lots of pickled things. Seriously, Russian food is so underrated. It's full of potatoes and mushrooms and pickles and cheese and eggs and dill. So much tastiness! 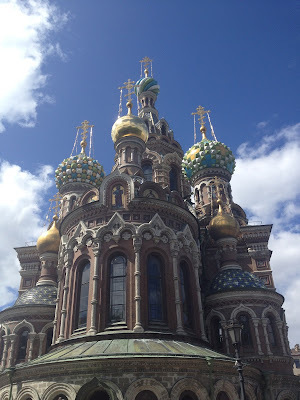 This trip was deliberately planned in late June to coincide with White Nights, when the city never gets completely dark. The sun set at around 10:30pm and rose again at 3:30. It didn't go far enough below the horizon to get completely dark and it was a really interesting experience to walk home from dinner at 9pm and see the sun shining. Luckily our hotel room had heavy drapes and I had an eye mask from the plane, so I was able to get some sleep. We took a train to Moscow and it was neat to see all the small towns and villages we passed through on the way. Our Moscow hotel was super swanky and only about a block from Red Square. The first place we went was to the iconic St. Basil's Cathedral. So many onion domes! There are actually more onion domes in Moscow than I ever expected. The day we planned to visit the Kremlin, all of Red Square was unexpectedly closed. Because it was a Monday, many other sites on my list were closed anyway. 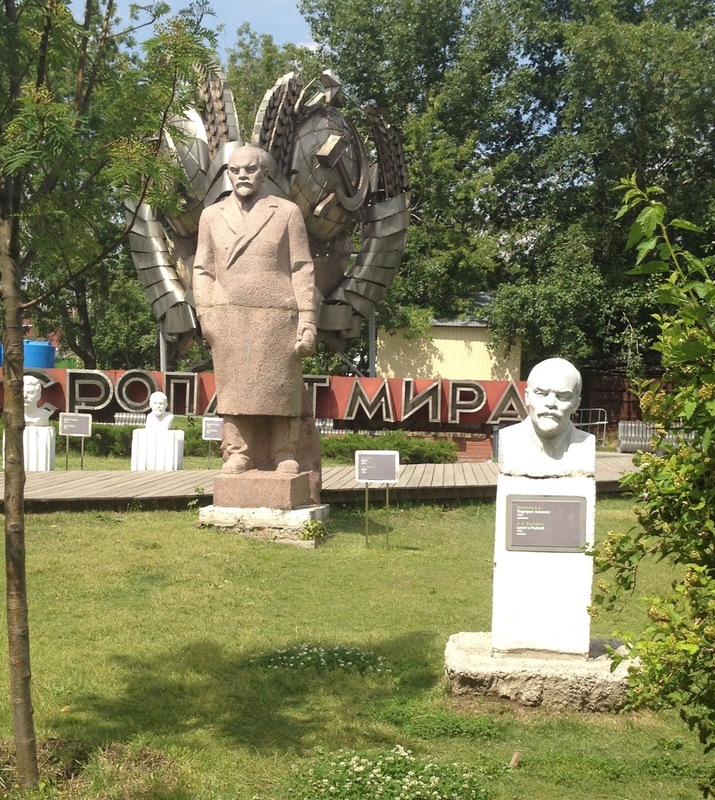 So we went to Gorky Park, where there's a really cool collection of sculptures. Many were from the Soviet era and were taken down in 1991. Here are two Lenins. We visited the Kremlin the next day, and did a tour of the Armoury. You're not allowed to take photos in the Armoury, but it's really fascinating. They have tons of stuff that belonged to the tsars, like fancy gold and silver relics, thrones, armor, carriages, and coronation gowns. I thought it might be boring, but it was actually kind of amazing to see these pieces of history. The free audio tour walked us through some of the things and provided background on what we were looking it, but there was way more than I could really look closely at in one day. There are also several cathedrals in the Kremlin, with onion domes. Our hotel offered a Russian Tea Ceremony, which we decided to try. 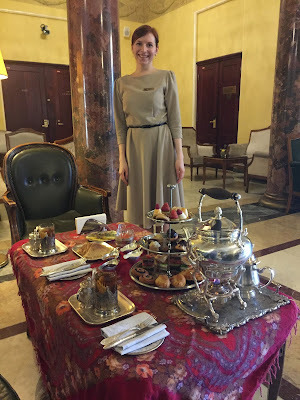 It was an elaborate setup of delicious tea served in fancy glasses, sandwiches, savory pies, blini, and little cookies and tarts. 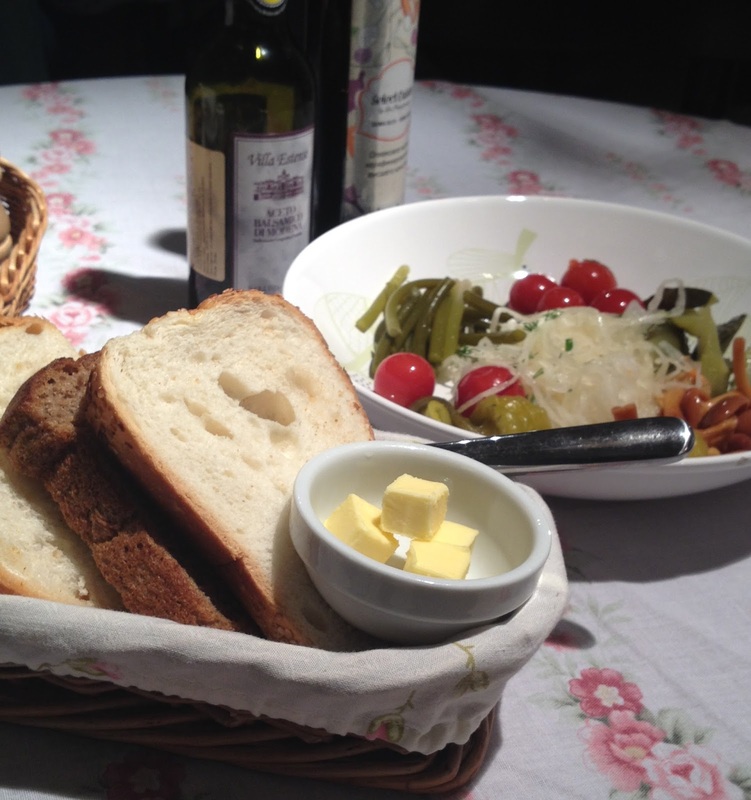 It was all served by Marina, pictured above, who was a lovely hostess. She teaches English and was very happy to chat with some Americans. We visited Lenin, who you can see in his tomb (he was embalmed and put on display) after standing in line for a long time. It was weird and surreal and we were not allowed to take pictures. 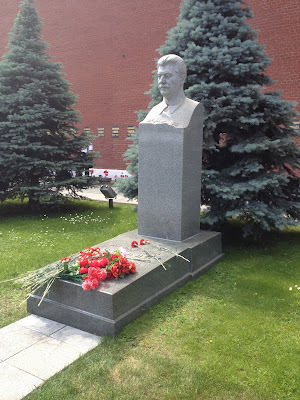 But I can show you the nearby grave of Joseph Stalin. I also couldn't take photos inside of Tolstoy's house, which was our next stop. But here's a picture of us sitting in his back yard. It was so neat to see where Tolstoy and his family actually lived, especially so soon after finally reading War and Peace. 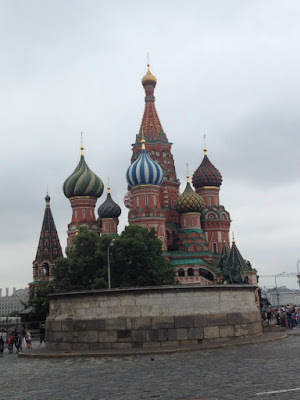 I liked both cities, but really wish I had more time in Moscow. I seriously think I could live there. It's a very classy city with beautiful architecture, a ton of things to see and do, and the most well-dressed people I've ever seen. It was a pleasure just watching people walk to work in the mornings, they were all so well put-together. Americans look like slobs now! On the other hand, I'm glad I don't have the pressure of having to dress so nicely every day. That would be exhausting and stressful. Enough people spoke English there that I didn't really need to use my extremely rusty Russian, which was lucky because my pronunciation is horrible and it's been so long that I can't ever remember basic things like the verbs of motion (which I never really grasped anyhow.) But it was incredibly useful to be able to read signs, so if you go I highly suggest at least learning the alphabet so you can match up street signs to what is printed on your maps in English. All in all, it was a fantastic trip! Russia has such a fascinating history, not to mention great art and literature, and it was such a great opportunity to actually go there. We saw just a small part of this huge country, and I'd love to see more of it someday. If you're looking for a someplace a little different for a vacation, I highly recommend it! I am so incredibly thrilled that you had such a good trip! I was so afraid you would come back and think I was nuts after all these years. Sounds like you had a nice trip. So interesting. Thanks for sharing your pictures with us all.